ტონგის ღარი — ღრმა წყლის ღარი წყნარ ოკეანეში. გადაჭიმულია სამოის კუნძულებიდან სამხრეთ განედის 25°-მდე 860 კილომეტრის მანძილზე. ტონგის ღარის საშუალო სიგანეა 178 კმ, სიღრმე 10 882 მეტრი, რაც მსოფლიო ოკეანის მაქსიმალური სიღრმეა სამხრეთ ნახევარსფეროში. სამხრეთით უერთდება კერმადეკის ღარს. ქართული საბჭოთა ენციკლოპედია, ტ. 10, გვ. 19, თბ., 1986 წელი. Dawn J. Wright, Sherman H. Bloomer, Christopher J. MacLeod, Brian Taylor, Andrew M. Goodliffe (2000). 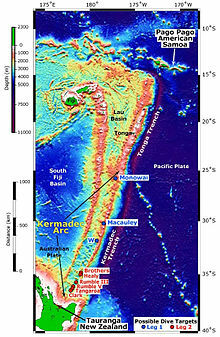 "Bathymetry of the Tonga Trench and Forearc: A Map Series". Marine Geophysical Researches 21 (5): 489–512. . http://dusk.geo.orst.edu/tonga/. Bird, P. (2003). "An updated digital model of plate boundaries". Geochemistry Geophysics Geosystems 4 (3): 1027. Bibcode 2003GGG.....4.1027B. . დაარქივებულია ორიგინალიდან 2007-12-13-ში. https://web.archive.org/web/20071213022939/http://element.ess.ucla.edu/publications/2003_PB2002/2003_PB2002.htm. ეს გვერდი ბოლოს დარედაქტირდა: 16:45, 13 ოქტომბერი 2016.